According to Vucic, bilateral relations between the United States and Serbia are on the upswing, there are more and more investors from that country in Serbia. I believe that Serbia will be regulated in accordance with the rights of a democratic society and that the legal system will function efficiently, so that the US but also all other investors are confident in their investments, he said. He pointed to the huge importance of preserving the stability and peace, adding that without it there is a good life for citizens. Serbia in a courageous way began to solve the economic problems, he said noting that the country was facing bankruptcy, but through fiscal consolidation measures managed to have a budget surplus and a higher growth of 2.6%. We expect to provide a better life for citizens, he noted, adding that regional stability is crucial. 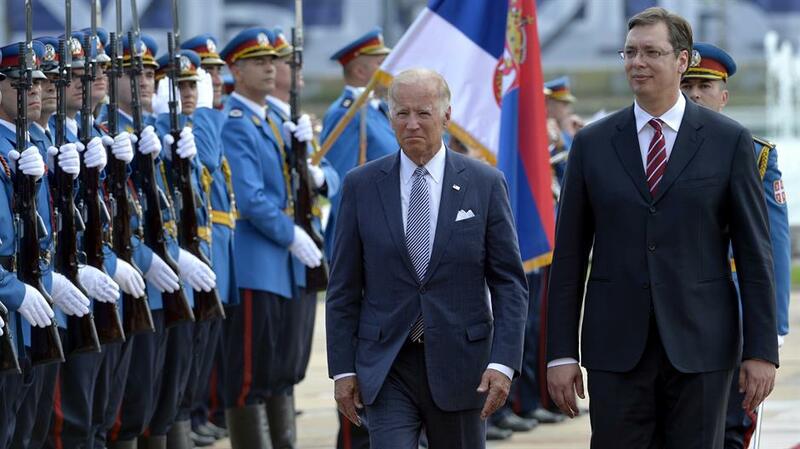 US Vice President Biden stressed that Serbia is a key political and economic cornerstone for the whole region and that the Serbian leadership is extremely important for this part of Europe. He said that US President Barack Obama, and he personally, highly respects the leadership of Prime Minister Vucic, which was demonstrated in the important moments, especially in relations with Croatia. Some moments of our common history were extremely painful, he said and added that he is happy that a new chapter opened in the relations between the two countries. Biden voiced his condolences to all the families who lost their loved ones in the NATO campaign. The United States and Serbia do not agree on every issue, there are a lot of scars and wounds that are alive from the 1990s, but I hope that we will take steps forward, and that the entire region will be marked by economic growth, said Biden.